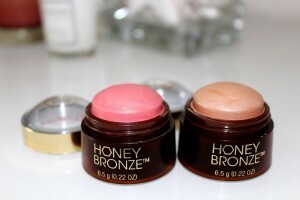 I spotted The Body Shop Honey Bronze highlighting domes on Em Sheldon’s blog and immediately knew I had to try them. 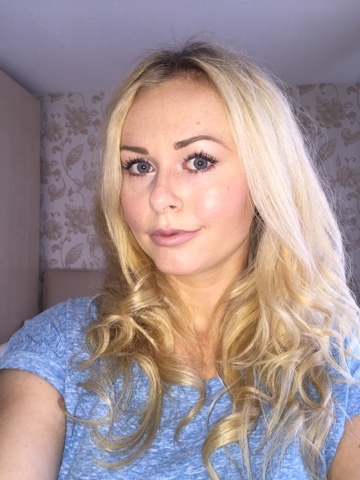 With strobing apparently taking over from contouring, I knew I had to up my glow game. There are three shades in the Honey Bronze highlighting domes collection: 01 is a golden shimmer, 02 is a pink blush with golden shimmer and 03 is a bronze. I’m not quite sure why they’re called ‘Honey Bronze’ given that only one product in the collection is actually bronze? I bought 01 and 02 as I prefer a matte bronzer for contouring. I immediately fell in love with the pink blush due to the gold flecks which looked beautiful when swatched, and I definitely think this is my favourite. To use, you can apply the product directly to your face, or dab a little on using your fingers and blending out. The product just slides on to your skin beautifully. I tried both, and found I preferred applying the gold highlighting dome directly to my face, but to use my fingers to apply the blush. The highlighters are overly pigmented, but definitely buildable. Wearing a mineral foundation, the application was definitely better when I used my fingers and patted it on, otherwise it lifted the powder foundation. I found I was left with a really natural finish and didn’t look overly ‘done’, which I think can happen when using powder highlighters and blush. I also really love the packaging; gold and tan. The packaging looks expensive and summery. The lid screws on and off so perfectly easy access. The highlighting domes are priced at £8 each and I really love them. If you only get one, definitely go for the blush. It’s gorgeous. Have you tried The Body Shop highlighting domes yet? Which is your favourite shade?